Savaria Vehicle Group can modify a van for one or two wheelchairs and install a retractable floor for easy entry and exit. Savaria Vehicle Group (SVG) of Laval, a division of lift and elevator provider Savaria Corp. of Brampton, Ont., says that as the general population ages, the conver-sion business will grow along with it. CEO Marcel Bourassa said the new SVG outlets will oper-ate through eight locations in British Columbia, Alberta and Ontario. “With the aging of the population and [people’s] desire to stay at home, the demand for our converted vehicles will continue to grow,” Bourassa said in an interview. The expansion was made possible in June 2016 when Savaria’s Silver Cross Automotive division bought Shoppers Home Health Care (SHHC), the automotive division of Shoppers Drug Mart. “We will be able to reach new markets and customers with this strategic transaction,” said Bourassa. Savaria provides accessibility for the elderly and physically challenged to increase their mobility and independence, so the vehicle group’s work in making minivans wheelchair accessible is a good corporate fit, he said. Savaria designs, manufactures, distributes and installs accessibility equipment, such as stair lifts, vertical and inclined wheelchair lifts as well as elevators for home and commercial use. 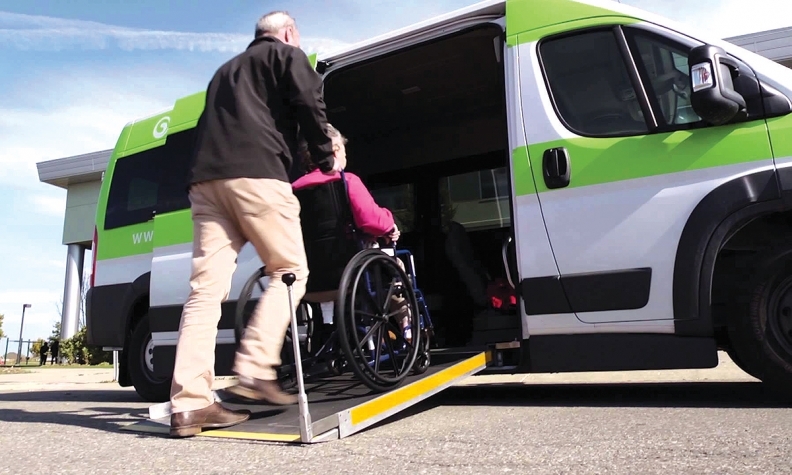 In converting and adapting vehicles for wheelchair accessibility, SVG modifies a van for one or two wheelchairs and can install a retractable floor for easy entry and exit. Customers buy their own minivan and bring it to Savaria. The group also sells wheel-chair-accessible minivans through its own network of authorized dealers. In the Montreal and Toronto areas, SVG operates show-rooms and facilities for vehicle conversions to sell directly to the public. In Montreal, additional vehicle adaptations can be performed, including the installation of driver controls. Company sales consultants “are also familiar with all government funding programs” and can help customers navigate the application process. Conversions cost about $20,000. When time comes for maintenance and repair, “it’s easy,” says Vice-President of Engineering Pierre Coté. The newly-acquired automotive locations will be branded under the Silver Cross banner, with locations offering the company's full portfolio of accessibility products including stair lifts, wheelchair lifts and scooters. Bourassa said acquiring SHHC Automotive is expected to yield new sales of about $15 million a year for the company, growing to an estimated $135 million in 2017 from $119 million in 2016. Savaria earns close to 60 per cent of its revenue outside Canada, primarily in the United States. It operates a sales network of 400 retailers and affiliates in North America and employs about 500 people, said Bourassa.